Okay, let's say, you now have the most wonderful home theatre display, offering true high definition resolution. Plugged into it you have a gorgeous Blu-ray player, or HD DVD player, or even a high definition digital TV receiver. So your source is delivering 1,920 by 1,080 pixels of resolution (1,920 by 1,440 in the case of some HDTV stations). Your display has 1,920 by 1,080 pixels of resolution. You have a HDMI cable connection between the two. So things are going to be wonderful, aren't they? After all, all the display has to do is take each of the incoming pixels, and place it in the bit of its memory that corresponds to the relevant pixel on the screen. When a whole frame worth of pixels have been loaded in (all 2,073,600 of them! ), it uses this bank of memory to drive the display panel(s), and the picture is as perfect as it can be. That's the theory. In practice, with many (perhaps most) displays, you have to avoid the beat. Our theory depends on something called '1:1 pixel mapping'. As the name suggests, that means that each incoming pixel is transferred to each display pixel. Not unprocessed, of course. The display still has to adjust the colour mapping and so forth, but it will not spread the incoming pixel around. It will be destined for just one pixel on the display. But many displays don't do 1:1 pixel mapping by default. Often they scale the picture anyway. Normally the purpose of the scaling is to generate a little overscan. This oversizes the picture so that its edges overlap the edges of the display, ensuring that the edges of the display picture are nice and straight. Some signals also have some visible timing information just above the display area ... and sometimes right at the top of the display area. A little overscan pushes this off the display. But this has unfortunate consequences: the beat. That's a term I've coined to describe this phenomenon, by analogy with musical instruments. If you are tuning a guitar, you will often press down on one of the strings at a particular fret to raise its pitch to match the pitch of the next string. You play them both together so you can tune the higher string to the lower one. But unless the tuning is perfect, you will get this rapid waxing and waning of the volume level, a kind of throb. Musicians call this a 'beat'. The rate of this beat (that is, the frequency of each cycle of its waxing and waning) is equal to the difference between the frequencies of the two notes playing at the same time. The closer the strings are to being in tune, the slower the beat. Get the two strings perfectly in tune with each other, and there is no difference in their frequencies, and no beat. The same is true for the scaling of a picture. The incoming signal is 1,080 pixels tall. Let's say the overscan imposed by the display is two per cent on each side, so the picture is scaled up to 1,123 pixels tall. Or, to look at it from a different angle, only 1,038 of the incoming pixels will be used to fill the 1,080 display pixels. Oh, oh, that sounds an awful lot like something that would have, in the world of music, created a beat. I've lately been using the extremely powerful DVDO iScan VP50 video processor. This, aside from it many other merits, has a number of built in test patterns. One of them is 540 horizontal white lines on a black background. 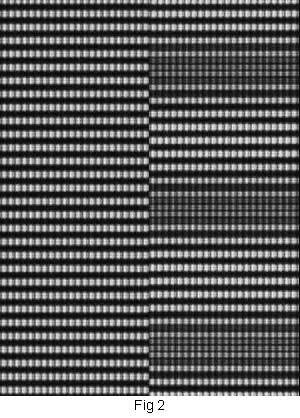 Play this on a 1080 pixel display, and every horizontal row of pixels, from top to bottom, should alternate white and black (540 white lines plus 540 black lines equals 1,080 lines in total). It also has another pattern with 960 vertical while lines on a black background, to give 1,920 alternating white and black lines on a true high definition display. If, that is, your display is capable of performing 1:1 pixel mapping. So let's see the beat in action. Fig. 1 shows a photo of a 1080p LCD display with a definite beat. This is showing the test pattern with the horizontal lines. 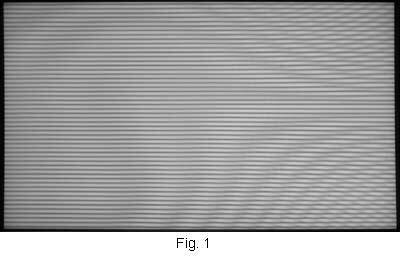 There are 52 dark horizontal bands (please forgive the wobbles towards the right of the picture, and the moire effect -- these are photographic artefacts). These bands are where several of the incoming horizontal lines fall on the boundaries of horizontal rows of the display's pixels, and are consequently smeared between two lines. Since there are 52 of these beats, we can deduce that this display (which was in its default setting) has scaled up 1,028 incoming lines to fill the display, pushing a total of 52 lines of incoming signal off the top and bottom of the display area, which amounts to 4.2% overscan at the top and at the bottom. The left side of Fig. 2 shows a closeup, where you can see groups of seven or eight of the incoming horizontal lines are cleanly rendered, while the three or four lines between each group are vertically smeared to form a kind of clump. But the display I used has a menu option to switch off overscan. Do that, and you get the result shown on the right side of Fig. 2. A perfect match! And no beats at all. The same works for the vertical lines test pattern, with the upper part of Fig. 3 showing the display with overscan on, and the lower part showing it without overscan. On a medium sized LCD display, unless you are in the habit of watching test patterns, this has few implications. But using a front projector onto a large display screen, this scaling will reduce picture sharpness. So read the documentation for your 1080p display device, and work out how to switch off overscan, or otherwise invoke 1:1 pixel mapping. If you are troubled by any signalling information that is shown on the top of the screen due to you turning off overscan, you can try masking this with the built in 'curtains' provided by some projectors and video processors. If this isn't available, just zoom the picture in a touch larger, so that the edges of the picture splash over onto the dark mat surround for your screen.